The sleek, compact and modular Apex 2™ follows in the footsteps of the Apex 3™ transit bike rack. The frame, wheel trays, and support arms have been designed to reduce bounce while the rack footprint is minimized for better vehicle turn radius, less turn signal and headlight interference and improved safety. This innovative 2 position bike rack is the new standard for bike racks on buses. All Sportworks bumper-mounted bike racks require a Pivot Plate, Brackets and Bolt Kit for proper installation. The Ten Second Bracket is an all-in-one option for quick and easy use. The Ten Second Bracket™ (TSB) is the result of a joint development effort between Romeo Rim bumpers and Sportworks Bike-Racks-for-Buses™. The TSB offers an integrated pivot plate and bumper bracket assembly that can be installed or removed in 10 seconds or less. Best of all, the bracket is safely secured using hand-knobs so no tools are required. Some TSB models come with dual mounting points to accomodate both Sportworks standard width and DL2 NP racks. This stand-alone Apex 2 pivot plate is required with a bracket when the Ten Second Bracket is not the preferred mounting option. Can transit racks fit on smaller community "cutaway" shuttles? Yes. We pay close attention to this market, and have designed various mounting systems that accommodate the existing features of these vehicles. Whether you have a Ford or Chevy cutaway, or larger International Navistar, we likely have a bracket to fit. NOTE: Due to the narrow size and stiffer suspension typically found on cutaway’s, Sportworks does not recommend using most 3-position bike racks (excluding the new Apex 3™) with these vehicles. Doing so may present safety issues related to bicycle retention, headlight blockage, vehicle turn radius, and lead to pre-mature failure of the bike rack. Will the racks interfere with vehicle safety equipment including headlights and turn signals? The amount of potential interference will vary from vehicle to vehicle. Sportworks works diligently to optimize the position of bike racks on current and new model buses. We can also customize almost any portion of the mounting bracket to adjust how and where the rack sits on the front of the vehicle. The majority of Sportworks mounting brackets include multiple holes allowing the rack to be adjusted vertically to identify the most ideal location. This vertical adjustment alone overcomes the majority of interference concerns that may be attributed to the bike rack. Are bike racks on transit vehicles compliant with federal and state regulations regarding vehicle lighting? In conclusion, Sportworks designs bicycle racks with many design constraints, both functional and legal, in mind. We are confident our transit rack products, when installed properly, meet federal law. Our intent when configuring a rack is to minimize any effect on installed vehicle safety equipment, including lighting, when the rack is both stowed and loaded with bicycles. Due to the variation of bicycle types and diversity in state law, Sportworks is not in a position to assure, validate or otherwise comment on compliance with state law. Our customers have found that local authorities are amenable to working with transit agencies in resolving any differences of opinion or interpretation of state regulations regarding lighting. Are transit racks easy to use and are there problems with bike theft? This has been a concern that has been raised by other agencies prior to a bike-on-bus program. Public transit agencies deal with this potential situation differently. Many agencies put disclaimers on their marketing and instructional information. Others use a permit system, where they have users come to a particular location and learn to use the rack (despite its ease of use), and sign a liability release. Other agencies actually allow users to lock their bike to the rack (most users do not take this option). The rack mounts on the front of the vehicle, with the driver looking down on it acting as a deterrent to a potential theft. Furthermore, use of the rack is so fast, the bus is not sitting idle any longer than it normally would be without a bike on the front. Is there a correct loading method to secure bikes in the rack? The support arm assembly is the literal backbone of our system. The support arm handle should be placed as close to the front brake and head tube as possible to ensure safety and security of the bike, and in all cases the handle must be closer to the head tube than the highest point of the tire. The patented design creates three points of positive contact on the tire, affording safe and secure transport. Are transit racks safe to use? All of our bicycle racks are designed to be used from either the curb side or the front of the vehicle, well out of harms way. In fact, the front mounted design allows you to be in full view by the bus driver while loading and unloading your bike. Sportworks transit racks were designed with the safety and convenience of the passenger in mind. How is liability handled by the transit agency? Our customers typically transfer the liability to the user through disclaimers via signage or within the instructional material. Are there concerns with the bike racks interfering with or damaging the bus washers? Sportworks designed the Bike-Rack-for-Buses to pass through the bus washer without damage to the rack, the bus washer, or the bus. Sportworks has racks mounted on thousands of public transit buses throughout North America. Only occasionally a bus washer challenges our engineers. A careful look at the washer or a slight modification to the bike rack typically eliminates the problems. In the recent years, we have become adept at bike rack and bus wash compatibility, and have even added a “Bus Wash” section to our Operators Manual. Does the front of the bus get clean when it goes through the washer with the rack installed? This answer is entirely dependent on the type of bus washer and the type of bus. The densities of the bus wash brushes and the slope degree of the bus front both affect how well the front of the bus get cleaned. Typically, the front of the vehicle does not have a problem getting cleaned. Will the bike racks interfere with towing, disabled, or broken down buses? Many of our customers can tow their vehicles without removing the bike rack. Sometimes, by deploying the rack, one can tow the bus. Sportworks has different mounting brackets available for the same bumper, giving customers the choice of a mounting method. Sportworks Ten Second Bracket is the ideal solution for fast and easy removal of the rack for vehicle towing purposes. By removing the rack but not the mounting hardware, one can tow the bus. One person can remove the rack from the coach in less than one minute the rack weighs less than 30 pounds and simple hand tools can remove the two pivot fasteners. Which buses will the racks fit? Sportworks has many different mounting brackets available, and we continue building new brackets as new model vehicles are released. Our design and engineering team has been able to fabricate a bracket for almost every bus our customers have requested. What type and size of bikes does this rack carry? Our racks are designed to carry an average size bicycle. We recommend bicycles with no longer than a 44 inch wheel base, 2.3 inch wide tires, wheel diameters of 20 inches or larger and a total weight of 55 pounds or less per bike. However, in many cases we have heard that some agencies stray from this recommendation in order accommodate the needs of their passengers. The rack was not designed to be used with motorized vehicles such as motor scooters, which generally fall outside of the carrying capacity. Can we mount racks on the back of buses? The rack was designed to mount on the front of the vehicle; however we do have customers who mount it on the rear. If your needs require mounting the racks on the back of a vehicle, we encourage you to take a careful look at your state DOT vehicle length requirements before ordering. NOTE: Installation and use of bike racks on the rear of vehicles is not recommended, and may void the manufacturer's warranty. For additional information about “Warranty Exclusions” please see Sportworks Limited Warranty. What is the impact of garage parking since additional space would be needed? In the stowed position, the bicycle rack folds up against the face of the bus. The amount of protrusion in this position varies from bus to bus - however it is minimal, ranging anywhere from 5.5” to 7.5”. For those who do not have even an extra few inches we have designed quick release accessories and brackets facilitating the quick removal of the rack or brackets. What are the costs of purchasing and maintaining racks? The costs associated with the initial purchase of the bicycle racks are minimal. Please contact Sportworks Northwest, Inc. for a detailed quote based on the vehicle type. This is less expensive than a standard transit bus tire! Best stated by Keith Martin, General Manager of Yuba-Sutter Transit, the racks are “low cost, high impact enhancement to [their] system, . . provide[s] increased system visibility, better multi-modal convenience and increased system productivity by attracting new riders”. 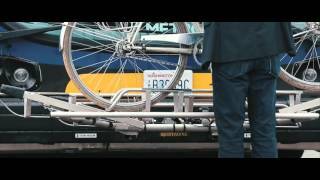 Sportworks designed the Bike-Rack-for-Buses to last the life of the bus. Sportworks always has a full spare parts inventory and our customer service team is ready to respond to immediate needs. Our standard warranty covers parts and labor for one year, and we have yet to see any major bike rack warranty issues. Can the racks be repaired if damaged? The racks are designed to last the lifetime of the vehicle. However, there are situations where the rack is involved in a collision and needs repair. We offer the parts necessary to do just about any repair to the rack. From hoop splices to support arm grips, Sportworks offers the parts and services needed to keep your vehicles in service. Should I have concerns about the rack being in my way when working on the front of the vehicle? The rack is designed to not interfere with the regular maintenance at the front of the vehicle. In fact, we have heard that in some cases it makes a great work table when performing regular maintenance. In more in depth repair situations the rack can be removed by simply removing two pivot bolts. How are the racks mounted and can my maintenance staff do the job? In almost all cases the rack interfaces directly with the bumper. No body panels need to be modified for installation. The stand-off mounting method is the most common and when it is an option, it is preferred, as it provides a secure base for the rack to mount to. We build to order. What this means is that we do not typically stock large numbers of racks. Therefore, on most racks delivery can take on average 8-10 days ARO. However, in cases where there is a “bus down” or vehicle out of service waiting for a replacement rack we are usually able to respond quite quickly on these smaller quantity emergency orders. In most cases our customers keep one or two replacements on hand in anticipation of such events. We currently offer our racks in two types of steel; stainless steel and powder coated mild steel. While the first racks to be shipped out our door were mild steel, we have seen a large shift toward stainless steel. Stainless steel offers superior corrosion resistance and keeps up its appearance considerably longer than powder coated mild steel. We offer our mild steel racks in black but have done other colors upon request. Please contact our sales department for more information on these and other finishes we offer.